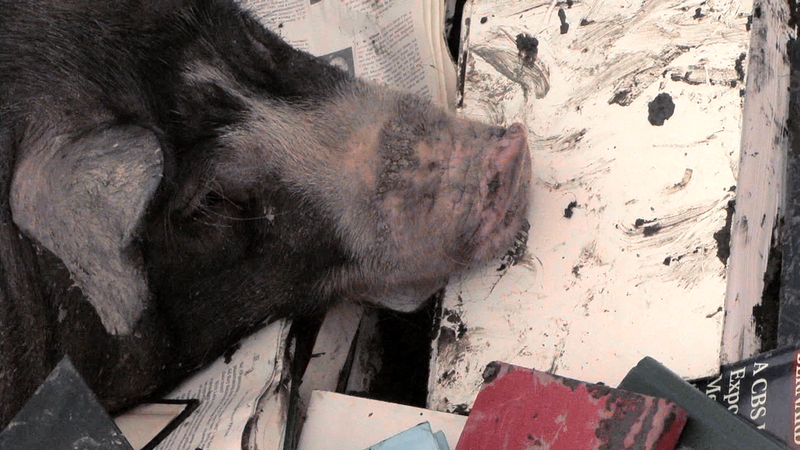 STREWN's first shot presents the teats of a lactating sow, drained of color, and beset with flies. A suckling shoat passes by without pause. The flies remain, alighting in silence. A piercing squeal presages the second shot of a spasmodic dark belly writhing in a wallow, with rows of blind teats perpetually convulsing in heat. All subsequent scenes are shot in a field of books: an egalitarian disorder of conflated taxonomies in which technical manuals, self-help guides, linguistic theory, and political and philosophical speculation are indistinguishable facets of liberated thought. 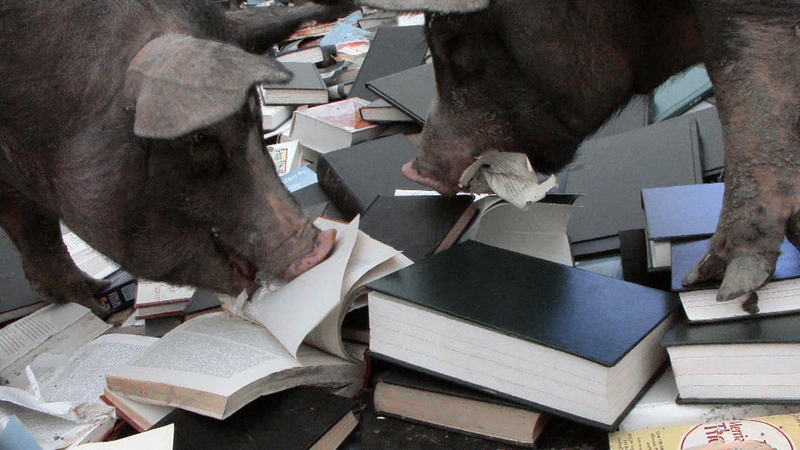 It is a library strewn in mud, tossed, flattened and sullied among swine. Text and image, the coherent and the inchoate are spread, savored and savaged with equanimity. The symbolic is shredded into a lexicon of loss, a continuous mass absent of association. The indexical and interpretive are devoured in a free and full feed. Hooves slide and stumble. Paper is rooted and pulped. Confetti becomes compost. Utterances of the highest and lowest order are espoused with drool in muck. Vestigial pages release their contents to the wind. Additional note: In fiction, swine have acted as agents of both revolution and repression; in reality, they have been agents of anti-intellectualism. During Pol Pot’s regime in Cambodia, the National Library was used as a stable and piggery. Its books fueled cooking fires, their pages rolled for cigarette papers. Behind the library, the National Archives were used as barracks to house those who butchered pork for soldiers; the library's garden was used for executing people. The uneducated were glorified - as they are in other countries today.